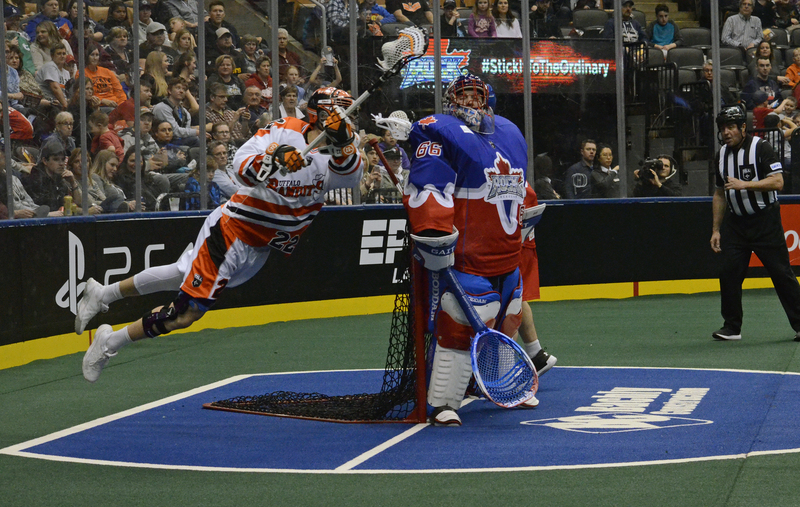 Overtime heroics by Brandon Slade of the Toronto Rock earned the team a season series sweep of their Eastern Division rivals – the Buffalo Bandits – in a thrilling 12-11 victory on Friday night at Scotiabank Arena. In two monumental moments, Slade scored two pivotal goals for the Rock as he tied the game at 11 with 3:03 left to play in the fourth. That would serve as a mere warm-up of what was about to occur, as moments later, Slade scored the biggest goal of the night and perhaps, his young career. “Honestly, I was just kind of gassed out there and you know the boys were going hard, battling hard all game, and we knew we needed this one,”said Slade on the moments leading up to his game-winning goal. “I went out there, got the goal, and just kind of blacked out. Looked around, saw Jonesy (Adam Jones), and that was it,” he added. Much like any other Buffalo-Toronto game, this game seemed to be the back-and-forth action fans have expected to see out of this rivalry. Opening the scoring in the first quarter, the Bandits seemed to have the momentum with a 3-1 lead. But this would not last long as the Rock’s offence started getting to work as Dan Lintner and Rob Hellyer knotted the game up at three apiece. Outscoring their opponent 3-1 in the second quarter for a change of pace, the Rock went to the dressing room up 6-4 with a lot of time left to play. 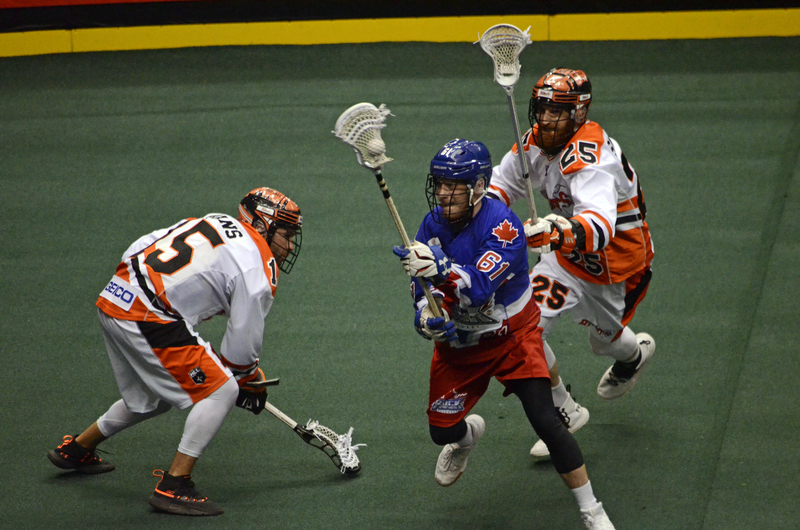 Erasing that deficit early into the second half, the Bandits showed just why they sit atop the Eastern Division as they scored four straight goals to give them an 8-6 lead. Doing their best to stop the bleeding, goals from Toronto’s Johnny Powless and Adam Jones found the back of the net tying the game up once again, this time at eight. Yet another tie would follow as Dhane Smith and Dan Craig put up each team’s ninth goal to start the fourth. But Buffalo, who took an 11-9 lead with goals from Smith and Steve Priolo, surrendered two goals from the Rock. Rob Hellyer let a shot go up the middle that beat Matt Vinc, and 59 seconds later Slade wove through a couple of defenders to tie it. This one, to nobody’s surprise, needed overtime. “We stuck with it there and that wasn’t the plan coming out of the half but that’s the game of lacrosse,” said Rock head coach Matt Sawyer on his team’s efforts in the second half. Showing no quit in the final stretch of the game, Slade would find the back of the net again for an acrobatic game-winning goal; compliments of Rob Hellyer and a perfectly drawn up play. This was a true back and forth matchup as the game was tied a total of seven times throughout the contest. Though Toronto got the last laugh in the game, Buffalo still remains atop the East with Georgia nipping at their heels.